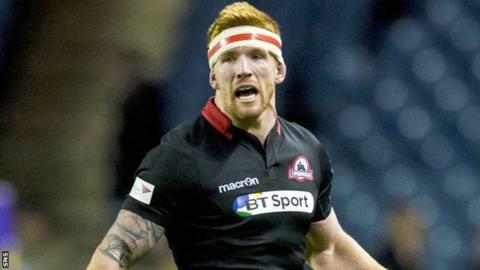 Edinburgh back-row Roddy Grant says the club is targeting silverware this season after coming within 80 minutes of securing a first European trophy. The capital club lost to Gloucester in the final of the European Challenge Cup back in May. After failing to secure a top six league finish in the last campaign, they will once again play in the second-tier continental competition. "We want to go one better and win it," Grant told BBC Scotland. "As far as the league goes that's our bread and butter. We were really disappointed with how we finished and we'd love to make the play-offs. Both are targets for us this season." Grant added that playing Glasgow Warriors this season will offer a new dimension to the rivalry between Scotland's two professional clubs after the Warriors won last season's Pro12 title. Edinburgh, who open their campaign against Leinster at home on 4 September, did beat the eventual champions in the festive 1872 Cup double header, however. "It certainly makes us want to do better; we want to be the best team in Scotland," he added. "But it's great for Scottish rugby seeing them do well, seeing a Scottish team win it. "It's great going out, especially in the 1872 Cup, after the defending champions."